Switchee, an IoT startup based in London, has raised £1.3 million in “pre-Series A” funding for its smart thermostat and accompanying cloud-based service. However, unlike consumer offerings, such as Nest, Hive or Tado, the company’s product is targeting large landlords, initially within the social housing sector. The idea is to help social landlords both tackle fuel poverty amongst their residents and as part of their social remit, and to provide a scalable technology solution for managing their properties. This includes something akin to an early warning system for common housing stock maintenance issues, such as mould, poor insulation, or a failing boiler. Leading the round is Fair by Design Fund, a new £15 million fund managed by Ascension Ventures and backed by Big Society Capital and Joseph Rowntree Foundation. It specifically targets companies tackling the U.K.’s poverty premium. Other backers of Switchee’s latest round include Contrarian Ventures, an early stage energy fund backed by Lietuvos Energija (the largest energy provider in the Baltics), and AU Capital Partners, a VC fund focused on the U.K.-India corridor and investing in technology companies in IOT, Smart Cities and fintech. Previously Mustard Seed, and ClearlySo invested. “We solve two problems, one on the resident side the other on the landlord side,” Switchee co-founder Ian Napier tells TechCrunch. “For residents, fuel poverty and high energy costs, with 1 in 10 households in the U.K. having to make a choice between ‘heating’ or ‘eating’. For landlords, the poor or non-existent data about their housing stock and resultant maintenance and repair inefficiencies. To give an idea on cost, the average annual maintenance spend per property is £4,000. We have even seen examples of Housing Associations not knowing which houses they own”. Interestingly, Switchee has decided to build its own hardware rather than, say, piecing together existing consumer smart home solutions or simply white labelling a competitor’s offering. This is something Napier says the startup has routinely debated internally but decided that to deliver a smart thermostat that truly fits the needs of social landlords, it was necessary to be fully vertically integrated, with bespoke hardware working in tandem with the Switchee cloud service and landlord analytics. And that seems to be working out quite well so far. Following two years of commercial pilots, including successfully deploying Switchee on a national scale last winter, the company says it is now working with over 40 of the U.K.’s leading social landlords, including Flagship Group, The Guinness Partnership, and Peabody, in addition to a number of Local Authorities and Councils. “We sell the hardware, which landlords give to their residents for free. We also sell access to our landlord SaaS dashboard which aggregates sensory data from Switchee thermostats and presents housing management and welfare alerts. These data insights allow landlords to better understand and manage their large housing portfolios, and the communities they house, more efficiently”. The Switchee device itself has temperature, light, motion, humidity and air pressure sensors, which it uses to learn occupancy and a property’s “thermal profile” i.e. how quickly it heats and cools. 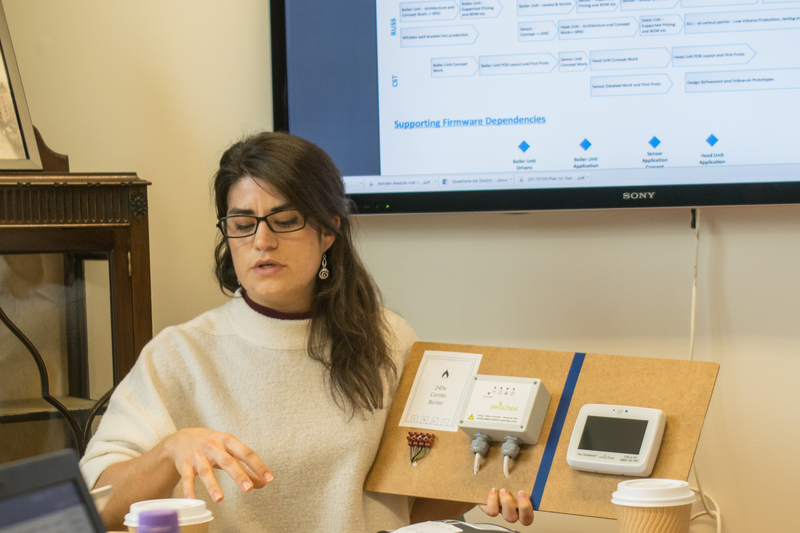 Based on this data, it then optimizes heating settings remotely — meaning that the Switchee device can be used passively, which Napier says is crucial for a non-direct to consumer offering — and as a result claims to reduce resident energy bills by up to 15 percent. It connects via 2G phone networks (in addition to WiFi) so as not to have to rely on a resident’s own internet connection. “We can be passive ‘fit and forget’,” says Napier. “Switchee will automatically calculate optimum heating settings and regulate heating to reduce wastage and cut bills. Residents who receive a free thermostat can be less engaged than a consumer who chooses to buy a Nest or Hive… so we can’t rely on engagement. But we hope residents will love our technology and use it. We just don’t need them to if they have other things going on”. The data the device collects is also used to produce a landlord dashboard displaying a range of welfare and maintenance KPIs and alerts such as mould risk, poor insulation, fuel poverty risk and boiler performance. “This facilitates a shift from reactive to pre-emptive maintenance, saving money and delivering better outcomes,” he says. On the topic of data privacy, Napier says the Switchee team believe in using “data for good”. In this instance, to combat fuel poverty and to help social landlords care for properties and communities more effectively. “The real key to data privacy, we believe, is transparency and communication: we explain to residents what information we are collecting and why. And we always obtain consent before installing,” he says. Asked specifically about the occupancy data the device collects and how it can be used, Napier says the company is not interested in the occupancy profiles that drive residents’ energy bill savings, only the outcome, i.e. lower energy bills. “Similarly, we don’t share raw occupancy with landlords, but we do have a couple of features derived from that occupancy. We can suggest convenient times for engineer, repair or other house visits. And we can alert landlords if we think a property has been abandoned,” he adds.